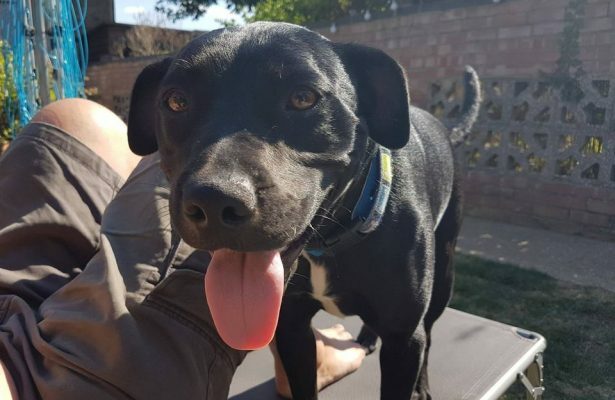 Is the most beautiful 18 month old lab x staff girl. She is a typical exhuberant pup, and will be an active companion who will thrive on exercise and training. Inky has been returned to us, and unfortunately now has some lead frustration which we have started working on, but this will need continued input. On lead she can be barky and over-aroused when seeing other dogs out and about, and requires someone calm and confident to work through this. 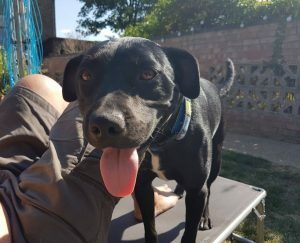 Inky loves the other dogs she is in foster with, and is well able to live with other dogs, just needs a sensible introduction to them. 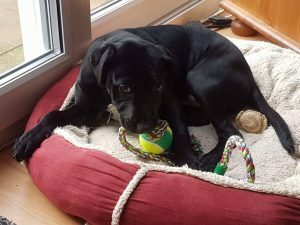 Inky will be rehomed with ongoing support with training and we will be looking for her new family who are prepared to help her be the well rounded girl that she deserves to be. Inky is incredibly people friendly, and loves everyone, but is still very bouncy, so older children of about 10 years would be ideal. Inky is very over excited by cats, so it is unlikely she will live with them unless they are very old and training is in place.